Senate Republicans will look to avoid a partial shutdown of the federal government, the leader of the chamber told reporters on Nov. 14. 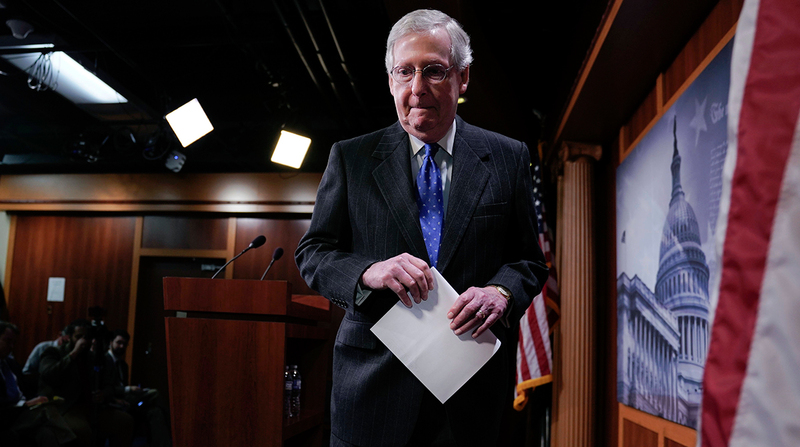 Senate Majority Leader Mitch McConnell (R-Ky.) stressed that his caucus would not consider a partial shutdown, a sentiment his counterparts in the House have echoed. Agreeing on a fiscal 2019 funding legislation is among the priorities that “absolutely have to be accomplished” prior to Congress’ adjournment. Congressional leaders have a target date of Dec. 14 to wrap up their legislative business. With less than a month left on the legislative calendar, McConnell acknowledged “we don’t have a whole lot of time left” to debate and advance bills to President Donald Trump’s desk. Funding authority for transportation programs in the funding bill that Congress cleared this fall expire on Dec. 7. Lawmakers returned to Capitol Hill on Nov. 13 after enduring bruising election contests that resulted in a win for Democrats, who will control the House next year. Republicans maintained their control of the Senate, offering Trump a divided legislative branch for the first time in his presidency. The transportation bills from the House and Senate include similar provisions designed to deny funding for the electronic logging device mandate for certain livestock haulers. That sector of the industry has consistently raised concerns about ELD rules to members of Congress. The mandate, which took effect in December 2017, requires carriers to equip trucks with ELDs to track drivers’ hours of service. Also on the docket in the Senate, meanwhile, is the consideration of several nominees. Key officials backed by Trump to fill top posts continue to wait on the Senate to decide their fate. The nominees include Heidi King for the administrator post at the National Highway Traffic Safety Administration, Diana Furchtgott-Roth to be an assistant secretary of transportation for research and technology and Martin Oberman, Michelle Schultz and Patrick Fuchs to be members of the Surface Transportation Board. Consideration of automated vehicle legislation in the Senate is likely to be pushed to the next Congress, aides familiar with the policy told Transport Topics. Key Democrats have blocked progress on the Senate bill, which would allow developers to test and market vehicles with the aim of facilitating their advancement in the marketplace. The House advanced its version earlier this year. Neither the House nor Senate versions include trucking-centric provisions.